I've mentioned my podcast, Victrola here before. We record hours and hours of improv and then edit it down into a half hour of "sketches". We recorded an album earlier this year and it comes out tomorrow. Here is an iTunes link to pre-order (which would be awesome for us since it helps us get more exposure once the sale starts tomorrow). Or use it to order it tomorrow. Or Bandcamp if you're nasty. If you want to sample the style. You can check out our free episodes on stitcher or iTunes. I think our newest episode is a pretty good one. The album is like a longer, better episode. Okay, I will retreat now. This is very cool! Now part of my iTunes library, too. "Oh, I wish I knew more about math..."
Are you Michael? You don't have to answer that, for Covertness' Sake, but KUDOS to your producer. I'll be subscribing to the podcast. I am not Michael, but he definitely put a LOT of time into this. 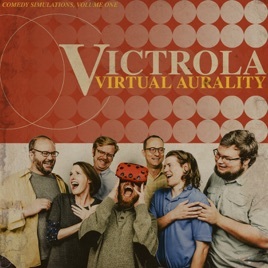 I am Lance (the guy with the VR headset on the album photo), I usually play the straight-man.